It is commonly believed that Roman soldiers were at certain times paid with salt. (They say the soldiers who did their job well were "worth their salt.") This, however, is debatable: 'salary' derives from the Latin word salārium, possibly referring to money given to soldiers so they could buy salt. The Roman Republic and Empire controlled the price of salt, increasing it to raise money for wars, or lowering it to be sure that the poorest citizens could easily afford this important part of the diet. Thank you, Ramona for the versatile blogger award. Visit Ramona at Curry and Comfort. I love the taste of this burger. It taste like chicken fried steak. Combine baking mix, 2 teaspoons black pepper, garlic powder and onion powder. Set aside. In skillet, heat oil over medium heat. In bowl, add ground chicken, 1/2 teaspoon black pepper, paprika, cayenne pepper, Worcestershire sauce, liquid smoke and french fried onions. Combine the ingredients and form 4 patties. Dredge each burger in the baking mix, shake off excess. Place chicken patties in hot skillet, cook about 8 to 10 minutes on each side, until no longer pink. Add slice of cheese on each chicken burger, cover, cook about 1 to 2 minutes, until cheese is melted. 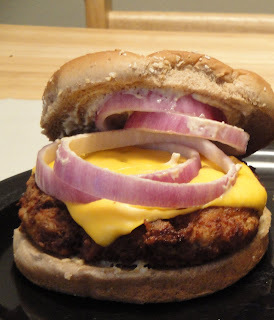 To build, spread mayonnaise on tops and bottoms of the buns, place chicken burger on bottom halves., top with red onions, then top with the top half of the bun. Enjoy! This sound so nice and delicious! This burger looks so delicious! We're always looking for new burger recipes and this one is a keeper. Thank you for sharing! Who doesn't like burgers? They are so easy on the eyes :) Best Wishes! This is amazing! I love fried chicken! On burgers? hell, yeah! Yum, I love chicken burgers. So tasty.